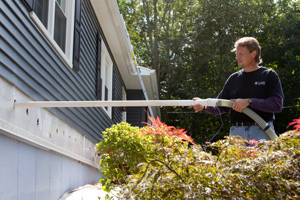 Blown-in insulation is also referred to as "blow-in" or "blown" insulation. It doesn't really matter which term you use. What DOES matter is the improved energy performance that blown insulation makes possible. Contact us today to schedule a Free Estimate for our experts to prescribe the best insulation for your needs. Blown insulation is a great option when insulating wall cavities. We offer our services in North Carolina throughout Raleigh, Durham, Cary, Holly Springs, Morrisville, Wake Forest, Knightdale, Fuquay Varina, and all surrounding cities and towns. 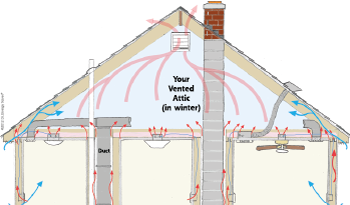 Heat movement and conditioned air leakage is virtually unimpeded across a poorly insulated and poorly air-sealed home. When air sealing is combined with an insulation upgrade, it's possible to reduce heating and cooling costs by as much as 40 percent. Wouldn't you be interested in cutting your "comfort" costs nearly in half? The installation method for blown fiberglass and blown cellulose is identical. A shredding and blowing machine located outside the house forces the blown insulation through a long, flexible hose that extends into the wall cavity, where a technician directs the flow. Blown fiberglass and blown cellulose insulation can be installed directly over existing insulation, providing that this older insulation is in good condition. We proudly offer a home energy audit to properly evaluate what areas in your home are the source of your comfort or energy problems. Once identified, we will provide the best solutions. We offer Free Estimates for insulation and the use of blown insulation in Durham, Cary, Raleigh, Fuquay Varina, Wake Forest, Holly Springs, Knightdale, Morrisville, and all surrounding cities and towns. Contact us today!